Whew! Last time I count on the Miami Dolphins for anything! I haven't liked that stupid franchise since Dan Marino and his rolling pocket upset my unbeaten Chicago Bears on the highest-rated "Monday Night Football" game ever late in the 1985 season. I'm sure I wasn't alone in using Miami as my top choice in Survivor Pool competitions last week, and the Fins tried their hardest to lose to the NFL's least-talented roster in Cleveland. With the Browns starting third-round rookie project Cody Kessler at quarterback for the first time and missing their top two receivers in the injured Corey Coleman and suspended Josh Gordon, among a few others, they still should have won. Miami QB Ryan Tannehill took a late sack trying to drive his team for a potential winning field goal attempt. Taking a sack is understandable. Fumbling the ball with 30 seconds or so left isn't. Being the Browns, kicker Cody Parkey missed the 46-yard field goal to win, his third miss of the game. Miami escaped in overtime. I re-learned a lesson from that game: base your Survivor Pool choice on the strength of the team you are choosing, not the weakness of the opponent. There were a few upsets in Week 3 that might have shaken things up in your competition. I actually predicted Buffalo's home win over Arizona, so hopefully you stayed away from that. It had trap game written all over it. I was certainly surprised injury-ravaged Minnesota won at Carolina, but the Vikings are too good defensively to ever pick against. Didn't see the Redskins winning at the Giants, the Rams doing the same in Tampa, the Falcons rolling in New Orleans or the Steelers being blown out in Philadelphia. It was definitely a good week to bet underdogs. The bye weeks start this Sunday, with the Packers and unbeaten Eagles off. Here are the picks for Week 4 -- not a lot of clear big-time favorites --- with the recommended team listed first. Arizona vs. Los Angeles: I'll be honest in that I don't totally love this, but I do think it stands out above the rest -- which for that reason alone could be reason to avoid it. Maybe the Rams aren't as terrible as they looked Week 1 in San Francisco. I do have a hard time seeing them win in the desert, however. 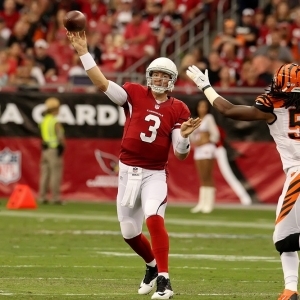 The Cardinals almost always play well after a loss under Bruce Arians. Cincinnati vs. Miami (Thursday): If this was a Sunday game, I'd probably be all over the Bengals. But you should really never use the Thursday game as your top choice with too many potential intangibles on the short week. Bengals do get back top linebacker Vontaze Burfict off suspension. Houston vs. Tennessee: This was going to be my top choice with the Texans on extra rest following last Thursday's blowout loss in New England. But then came the news that superstar defensive end J.J. Watt could miss the rest of the season with his back problems. That's devastating news, and a Titans upset over a shell-shocked Houston team wouldn't stun me. Washington vs. Cleveland: Sorry, don't trust Kirk Cousins enough to make the Redskins a Survivor Pool top pick at all this year. The Skins did show me something in last week's comeback win to save their season. Shame this won't be the on-field return of Robert Griffin III to Washington. Pittsburgh vs. Kansas City: It's a pretty weak schedule in the NFL in Week 4 as this Sunday night matchup is the only game of the week featuring two 2015 playoff teams. I don't know what happened to the Steelers in Philly, but they will rebound here with the return of top running back Le'Veon Bell off suspension. New York Jets vs. Seattle: Yep, this screams upset. Early start for the West Coast Seahawks and even if quarterback Russell Wilson plays, he's really banged up. If I'm Pete Carroll, I sit him because the Seahawks are on the bye next week and thus Wilson could really heal up. New England vs. Buffalo: It's the Patriots' final game before Tom Brady returns. The Bills might be able to pull the upset if Jacoby Brissett starts again for New England, but not if it's Jimmy Garoppolo. Not clear which injured QB it will be yet. Carolina at Atlanta: I was wrong on Atlanta winning Week 1 vs. the Bucs , wrong on the Falcons Week 2 losing in Oakland and wrong on them Week 3 losing in New Orleans. So I'll just stay away from that team for a while. The Panthers might be extra motivated as the Falcons ruined their potential perfect season in Week 16 at the Georgia Dome last year. Baltimore vs. Oakland: Ravens are one of five unbeatens, but their opponents thus far are a combined 1-8. The Raiders have never won at Baltimore. Detroit at Chicago: I've already moved on from my Bears in 2016. Total joke. Keep on losing boys, Deshaun Watson awaits! Lions win seventh straight in series. Denver at Tampa Bay: Could be a bit of a trap game for Denver after facing three playoff-caliber teams and beating them all to start the season. Raise your hand if you had predicted Trevor Siemian as the significantly higher-rated QB over Jameis Winston entering this game? Yeah, didn't think so. San Diego vs. New Orleans: Glad Drew Brees is on my fantasy team. Glad no Saints defenders are. This is Brees' first game back in San Diego since leaving the Chargers as a free agent a decade ago. Dallas at San Francisco: I wouldn't actually touch the Cowboys if Dez Bryant misses this game. MRI results of his right knee was to be made available later Wednesday. Minnesota vs. NY Giants (Monday): The Vikings blasted the Giants late last season, but New York had nothing to play for and no Odell Beckham Jr. Eli Manning has struggled vs. Minnesota in his career and is 2-5 against the Vikes. Jacksonville vs. Indianapolis: I'm totally disappointed in the winless Jaguars, and I fully expect Coach Gus Bradley to be fired if Jacksonville loses this 9:30 a.m. ET game in London. The last two NFL teams to lose a Week 4 game in London fired their coach afterward.